We are past half-time on our one-month vacation in Europe. On the weekend we returned to Germany after two wonderful weeks in Portugal. What a beautiful place Portugal is! We stayed in Cascais near Lisbon, to me the best kept secret for an amazing summer holiday. To many people, only the Algarve in the south is known as a holiday destination. Cascais seems to be reserved for mainly Portuguese to spend their holidays. Foodwise, it is paradise if restaurants serve food to their own people. They stay true to themselves. They don't need to try and impress or satisfy other tastebuds as it often happens in very touristy places. In Cascais, you'll find seafood restaurants about every 50m into any direction. Portuguese friends of ours provided us with a list of restaurants that are particularly good and inexpensive. And this is what we did: eating ourselves through these recommendations and a self-made list of typical Portuguese dishes. I must have had several kilos of grilled bacalhau dishes (made from dried salted codfish), fresh grilled sardines and prawns during those two weeks. In our luggage, we now have several kilos of bacalhau, as I want to try to recreate a few of the dishes when we are back in Dubai. It was a lot of food over the past two weeks. Good, honest and fresh food, no doubt, but a lot. We are now at my mom's house, who is on holiday in France for another week. It's also a one-week break before we will be served heavy German home fare. We all crave some light dishes and salads. I'll be very happy to make us just that for a whole week. I do crave savory muffins every now and then. Due to these cravings, this herb muffin recipe has been brought to perfection while I was still in Dubai. They used to be my lunch very often. I love the texture of a muffin, but prefer a grain-free version. These days, I often crave savory over sweet things. 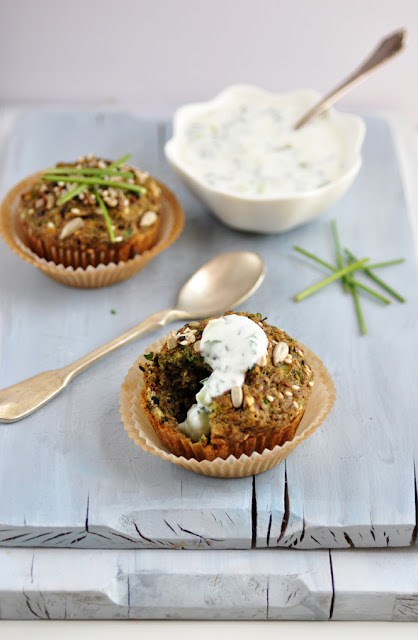 So a good amount of herbs and spices in the muffins and freshness added with a tzatziki dip does make a satisfactory light meal that keeps you full for a few hours. Enjoy! Preheat oven to 200C/400F. Line or grease muffin molds. In a bowl, combine coconut flour, flax meal, baking soda, nutritional yeast, salt, and za'atar. Mix well. In another bowl, lightly beat the eggs. Stir in coconut oil and water. Combine wet and dry ingredients. Make sure there are no lumps int he batter. Stir in onion, parsley and seeds. Fill the muffin molds with the batter. Bake for 25 minutes or until tester comes out clean. Combine all ingredients in a bowl and stir well. Transfer to airtight container and keep in the fridge for a couple of hours for the flavors to blend. Serve cold from the fridge.